From Everyday Is Christmas, out now on Atlantic. Who doesn’t love the Fonz? 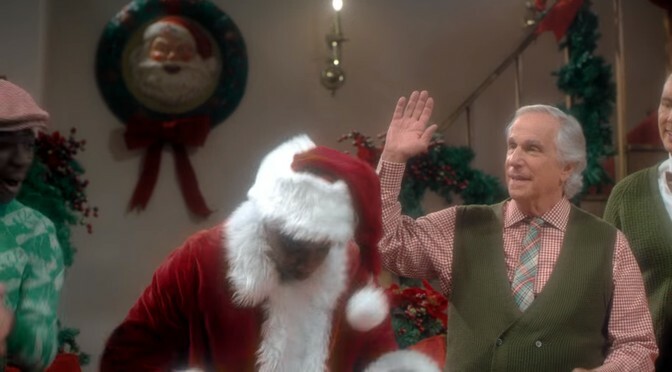 Seriously, every time I see Henry Winkler in anything, my heart is filled with joy. He has such a jolly aura that he exudes happiness. And what more could you ask for in a video for a Christmas song? Confession: I like Christmas music. I look forward to hearing “Rockin’ Around The Christmas Tree” by Brenda Lee and “Jingle Bell Rock” by Bobby Helms. “Little St. Nick” is one of my favorite Beach Boys songs. I don’t have much use for new covers of the classics but I love the originals. And I appreciate that artists still write and record new Christmas songs. It might seem like a crass cash-in on people’s holiday cheer, but I dunno. It’s fun. And festive. Loosen up, people. Drink some eggnog and get in the spirit. I don’t know much about Sia other than she’s mysterious and weird on “Saturday Night Live” but this is a fine new Christmas song. And the video stars J.B. Smoove, Dax Shepard, Kristen Bell, Henry Winkler, Susan Lucci, Sophia Lillis, Wyatt Oleff, and Caleb McLaughlin. Ho ho ho. Sia: web, twitter, amazon, apple, spotify, wiki. “Run, Run, Rudolf,” “The Christmas Song” (Nat “King” Cole version) and “Santa Claus Is Coming to Town” (Jackson 5 version) are my top three. I love Frank Sinatra’s “Have Yourself a Merry Little Christmas” because he sounds so palpably broken-hearted (having just been dumped by Ava Gardner). That whole album is the opposite of jolly. Of course, Judy Garland’s version is equally sad and great.